Last modified February 24 2016, 21:21:05 MET. "Ooh! My Record shows just question-marks in all fields, what's that?" In the Options for a Field the user can choose between an Indexing of None, Minimal, and All. While None seems clear (no index exists) this does not mean, you can't search in this Field - it just takes significantly longer, since the search field of every record has to be compared to the search criteria. 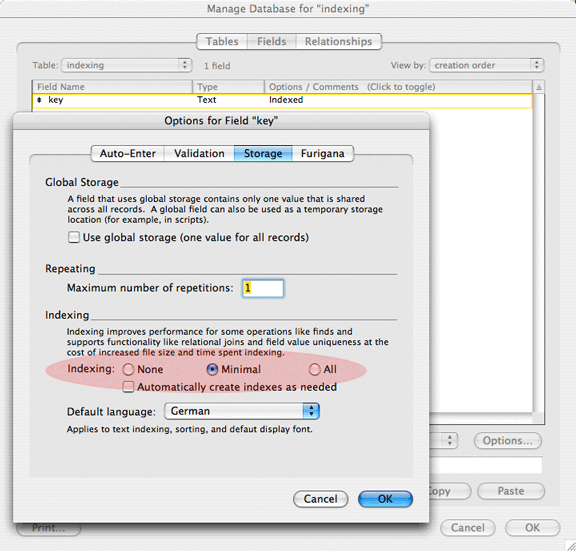 None Prevent FileMaker Pro from indexing the field. Minimal Create a value index of a text field’s contents or a calculation field returning text results. All Creates both word and value indexes for text fields or calculation fields returning text results. For number, date, time, and timestamp fields, as well as calculation fields returning results of these types, All creates an index of a field's values. The meaningless "Minimal" would be better substituted by "Value Index" and "All" by "Value and Word Index". So what exactly is a Value and a Word Index? Value Index This index is needed only for Relationships. In a text field, the first 100 characters of each text line - regardless of being spaces or "real" characters - are taken as the key entry. The remaining characters and words are ignored. Numeric fields - these include date, time, time stamp, and number fields - use up to 400 digits for the value index. Using numeric indexes (containing no spaces or other characters) is therefor very space efficient. Word Index This index is used to Find all records in a table that (for example) contain specific words (or parts thereof) within a field. Found Set the current Found Set. So what problems can arise, how are they recognized, and possibly cured? As we have seen, a single bit can make a big difference for the functionality of a file. How do I know there is an index problem with my file? Depending on the Index Type there are different symptoms indicating a flaw. Record After Show all Records, a Record entered earlier is not shown or all fields appear as a question-mark. Value A Portal or a Go to Related Record either shows more than or less than the expected number of matching records, or all Fields of one Record appear as question-marks. Word After a Find either more than or less than the expected number of records containing the searched Word are shown, or all Fields of one Record appear as question-marks. Found Set This case has no practical relevance. Depending on the Index Type there are different methods to salvage the index - if at all possible. Before any further action, make sure to use FileMaker Pro 9.0v3 or later, which fixes a bug that might make FileMaker Pro under specific conditions "forget" to reset an index bit and hence such non-existent Records show up with question-marks in all fields. Update occasionally used NoteBooks too. Please note: simply updating FileMaker Pro does not cure any pre-existing index flaws. These have to be "repaired" (see below). Value or Word Make a Clone of the original file and Import the data from the original file, table by table. This makes sure all indexes are being rebuilt and are up-to-date. This problem is a frequent issue. Found Set This index is rebuilt with every new Find and hence never an issue. Record This Index can NOT be repaired. If a Record (that would otherwise be lost) can be shown through a Find or Go to Related Record, Export it to a new table or file, delete it in the original table, and then re-Import it (auto-enter option off!). The original data is rescued although it now has a new Record ID. This problem almost never appears though. If you can't delete a Record with all fields containing question marks - and you usually can't - make a Clone of the original file and Import the data from the original file, table by table. This makes sure all indexes (including the Record Index) are being rebuilt and are up-to-date. I hope this helps to better understand index problems, also known as Ghost- or Phantom-Records. This page will be extended/completed as time permits.